It’s one thing to be excited about taking public transit everywhere… Walking everywhere is great exercise! We don’t have to pay for gas! It’s so beautiful to take the ferry under the Harbour Bridge! Naomi doesn’t have to be strapped into a car seat! No traffic! Ahhhhh!!! But it’s another thing to have no car when it’s been raining, cold and gusty for the past oh 3 days, and your toddler goes crazy if she’s indoors too long. I am not a fan of this. 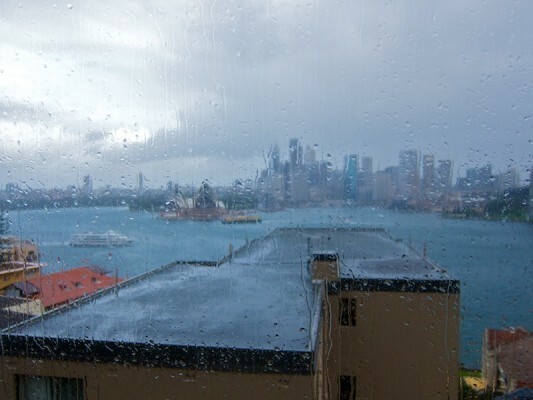 Our view, in the rains of this week. One night the downpour was so heavy, we couldn't see any of the lights in the city. If you know me, you know I actually like rainy weather… at least when I’m in Southern California. I’ve long suspected that this is because it happens so rarely there, rather than because I truly love it. It’s almost novel. And it’s not that 3 days of rain is so tremendously drawn-out, but to be honest, when you don’t have a car it really stinks to have to walk everywhere in the rain. With a one-year-old. But a plan to go to the zoo is either code to God for “please send buckets of rain” (this happened last week too), or the forecast was just really screwed up, because Wednesday turned out to be much colder, much windier, and much wetter than any other day that week. I ditched the plan for the zoo when I realized it was already 9:30 am and we were just getting out the door (since Naomi usually naps around 11 or 12, and transit alone takes 2 hours to/from the zoo). Also, the day before, the construction upstairs hadn’t actually been so bad; maybe today the noise level would be almost tolerable? I decided we’d just go to the park, come home for her nap, and then maybe head to the zoo in the afternoon if the weather cleared up. 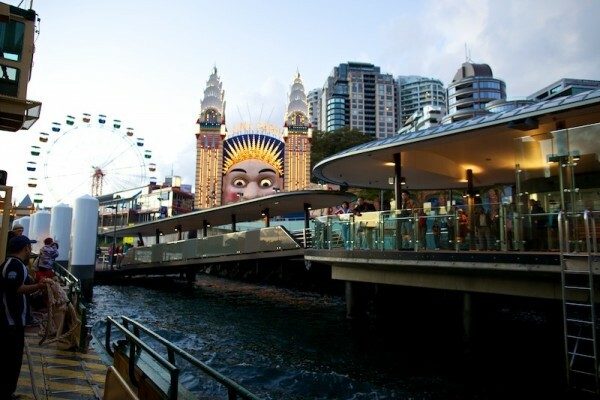 The park idea bombed (it was empty and thus lost half of its charm to my toddler), so we ended up walking down to Luna Park, Sydney’s amusement park which is also where our ferry landing is. The clown face at the park entrance is a Sydney icon. He completely freaks me out, but for some reason Naomi isn’t bothered by him. Probably has something to do with the monkey noises she makes at him whenever she sees him. The freaky Luna Park clown that greets us at our ferry landing, Milsons' Point. You can't see his huge teeth in this shot. I’d heard Luna Park is free to walk around in (though it costs to go on rides), and I thought she might enjoy doing that, as her newest “thing” is helping Mommy push the stroller. I was right that she’d be very intrigued by the bright lights and colors; I was wrong about her being content just pushing the stroller around and looking at things. Not being able to go touch any of the brightly-colored (way overpriced) rides soon turned into a tantrum, so we quickly left. Then Daniel called to say construction had started upstairs, and was quite loud. And then, when everything was looking pretty desperate, a ferry pulled up to the landing next to us, and it was heading toward Circular Quay (the main wharf, from which the zoo ferry departs). 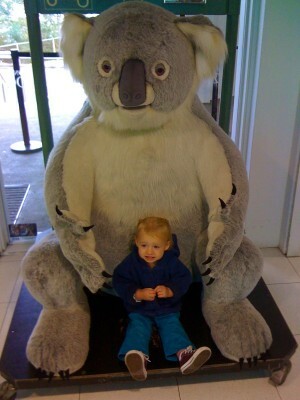 In a moment of impulse, I wheeled the stroller onto the ferry and decided to go to the zoo. The serendipity continued at Circular Quay: the rain cleared, and while we usually juuuust miss the zoo ferry when our ferry arrives, for some reason this time I got there with 5 minutes to spare, so we just hopped on the zoo ferry and were on our way. Things were looking up. We arrived at the zoo and took the bus to the top (the entire zoo is one big hillside, with one entrance at the bottom – requiring that you walk up to see everything – and another entrance at the top – so you can freeload and walk downhill the whole way). 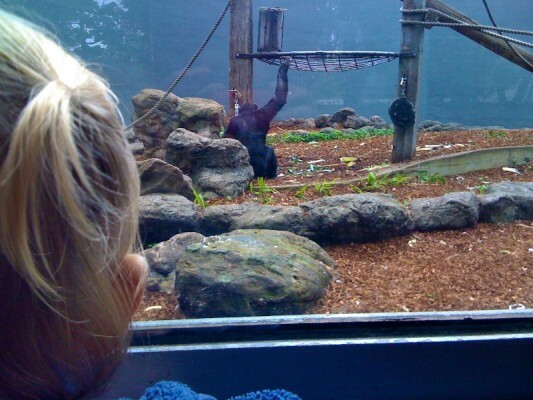 First stop was the chimpanzee house – Naomi LOVED it! I might have actually enjoyed it even more than she did, because it was such a delight to watch her watch them. There was a baby chimp and several adults, and she was fascinated with their swinging and speed at climbing up and down. Naomi watching the "ee! ah!"s. After awhile we moved on, and when she saw a group of school kids sprawled across a lawn eating their lunches, she was ready to eat (with them, of course). By the time we were nearing the end of lunch, it was starting to rain again. Luckily, I knew there was a Parents’ Room nearby, so we hurried in there to finish eating in a dry place, and also so she could play on the little playground in there. I would wear this shirt. 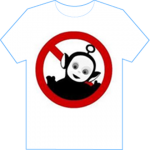 Except that I refuse to wear a picture of a Teletubby. This was mostly a success. Except that the video playing in there was Teletubbies. Naomi liked them of course. Oh well. She became more interested in playing than eating (nothing new these days), and eventually I started thinking we should get going. It was still pretty chilly and since I hadn’t planned to come to the zoo, I had left behind my scarf, rain coat and umbrella, so I wasn’t relishing the idea of walking around for 2 hours in the rain so Naomi could nap in her stroller. I called Daniel on the phone, and he said he could meet up with us soon, so if we took the ferry back to Circular Quay we could meet up sooner and go somewhere dry. I was fed up with everything but said ok.
At this time, I was conscientious enough to note what time the next ferry would leave the zoo (usually I forget to do this and then just miss a ferry/train/etc.). I noted that we had about 15 minutes to get there, which should have been plenty of time (which means just about enough time, realistically). The ferry ran only every 30 minutes so I was motivated to make the soonest one. But Naomi had a stinky diaper so we stopped to change that, except like I mentioned in a previous post, the changing tables in these Parents’ Rooms are made for kids about 2/3 her height (are most Aussie kids potty training by this age?? ), so her legs hang off and she hates it. This time it led to her getting out frustration by kicking me in the stomach over and over, while the stinky diaper was open and getting everywhere… very nice. So trying to incorporate discipline, while cleaning up, while feeling cold and defeated by the weather, while trying to hurry for the ferry… it was one of those high moments in parenting, I tell you. After all of that, and managing to coerce her into the stroller, I zipped us as fast as I could down to the bottom of the zoo, a process made longer by having to wait for a few elevators. My time was running out and I still wasn’t quite out of the zoo. I started to run. After exiting the last gift shop, I was trying to find the last elevator to take me down to the road to the ferry landing, but I got lost, and found myself running a ways down a path that dead-ended, then having to run back, only to find myself and the stroller facing a few flights of stairs. Beautiful. You have 3 different elevators for wheelchair visitors, and then you peter out and leave them to fend for themselves against a few flights of stairs at the end? What’s up with that? I picked up the stroller and jogged down the stairs as quickly as I could. Now I was finally on the road, and could see the water. My watch told me that it was exactly quarter after twelve (the time of departure), but I remembered on our last trip to the zoo feeling irritated because the ferry took off late, and wondered if it might happen again. I sprinted as fast as I could, but about 200 yards from the wharf, I finally passed a clearing in the trees and could see the ferry already pulled away from the landing and on its way to CQ. Rats. Another family had also missed the ferry, and one girl mentioned that since the gift shop was only a 3-minute walk, she was going there to wait for the next ferry. 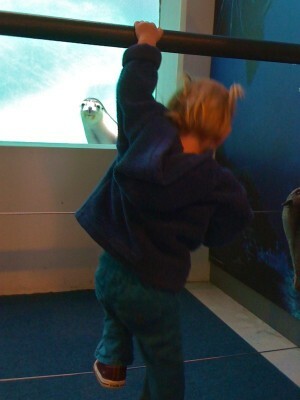 I remembered that there was a really neat wall in there which was completely glass, and there were seals swimming on the other side of the glass. I knew Naomi would probably enjoy that. I seriously did NOT want to find the silver lining of this situation (when I’m mad I want everything to go completely horribly so that it’s truly pathetic and I can really feel sorry for myself, and this story would be so much more pathetic if I’d had to wait a half hour on a cold ferry landing in the rain, don’t you think?) Just as badly, I also did not want to walk back up that hill I’d just sprinted down. But I made myself turn around and head back. I tried to walk back into the gift shop, but was chastised by a zoo official a few feet away – apparently that was the entrance to the zoo (?) so she wanted me to pay first, which meant standing in line, out in the cold rain. I sighed, knowing I’d just spent the whole morning in the zoo, and had an annual pass, but did it anyway. Once inside the gift shop, though, when I saw Naomi’s face light up at the sight of the seal swimming just on the other side of the glass, I was glad we’d come back. I called Daniel to tell him we’d missed the ferry, and told him we were waiting in a fun spot. He said if I wanted, I could just wait at the gift shop and he’d find us there. Naomi found lots of wonderful treats in the shop – she could hang from the railing while watching the seal at the same time, there were some very soft and squishy stuffed animals (allllll kinds of animals) for her to kiss and hug, and there was even an enormous stuffed koala for her to seat herself on. After awhile, I glanced at my watch and noticed that, if we’d been planning to catch the next ferry, we should leave now. I was still a bit undecided as to whether we should or not. On the one hand, she was having a good time now, but on the other hand, if the good times soured it would be a whole half hour (in a gift shop with lots of breakables) before the next ferry. I debated as the minutes ticked by. I’d just decided to stay, when Naomi got tired of playing with the things she was allowed to play with, and began to seek mischief. I quickly vetoed my previous decision, picked up all the stuffed animals she’d just thrown off the shelf, packed up our things and raced out the door, pushing the stroller with one arm, and holding her by her waist with the other. I did a repeat of my previous sprint down the hill to the ferry, this time with a peculiar and unfortunate warm wetness creeping down my pant leg, but at least we made it. Just. They literally were pulling back the ramp when they saw me sprinting, but compassionately held off about 30 more seconds so I could jump on. I called Daniel to tell him we’d made the second ferry, and also to ask him to bring me a change of pants. The ferry ride back was a bit dicey, as Naomi was now very overtired. I knew that the ferry back home would probably be leaving close on the heels of this ferry’s arrival, so I got us all ready to try and run across Circular Quay to make it (since of course the two wharves are on opposite ends from each other). We disembarked, we ran, we missed it. Double rats. It was another half hour til the next ferry. Public transit how I despise you! Daniel called and I told him I was going to take the train as I just couldn’t imagine sitting here for another 30 minutes – this whole wet, cold, frustrating experience needed to be over as soon as possible, and trains run every 5 or 10 minutes. He pointed out that I’d have to change trains and manage some stairs with the stroller, so I grudgingly agreed to wait for the ferry. It wasn’t as bad as the ferry ride – Naomi was able to run around at the landing and it was covered so we were at least dry. The ferry finally came, we finally made it to Milsons’ Point and that ghastly clown face at Luna Park, and then it was just a matter of pushing the stroller home in the rain up the steep hill that lies between Milsons’ Point and our apartment. Once home, I sat by the heater for the rest of the afternoon. That was so awful I can’t even comment. The Teletubbies and the icky clown just topped it all off. Love you, honey.